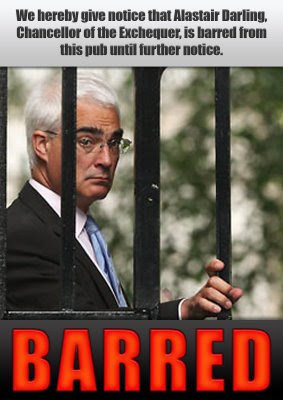 There is an uproar across Britain, as the Chancellor, Alistair Darling, has proposed an 8 % raise in beer duties for next year. As the economy is stumbling into recession and pubs are already closing every day, this is seen as a declaration of war by the pub trade and its customers. Now, if the intention is to curb binge drinking, he should have had a look at the supermarket booze where there are prize wars for lagers. There are ample opportunities for taxing and regulating that end of the market it that’s what he wants. I’m amazed that a government that is struggling as much as it is is willing to go for such policies. I’m sure the Tories are laughing all the way to the pub! Now, if more of the campaigners could have made some jpg illustrations instead of pdf files, I’d be happy to display them, OK? John is another beer blogger using the WordPress platform, he focuses on reviewing craft beers. And his reviews are enlightened and well written – but it is his photos that take your breath away. Go ahead! They, being the MidWestMicroBrews, are giving away one of these to a lucky winner, but I am seriously considering buying one. There are things happening in Oslo. As I wrote recently, there is a need to educate both bar staff and drinkers. Until recently this was not a problem at all, a we couldn’t get anything more exotic than stout from St. James’ Gate. Looks like the breweries have had some capacity for domestic marketing. 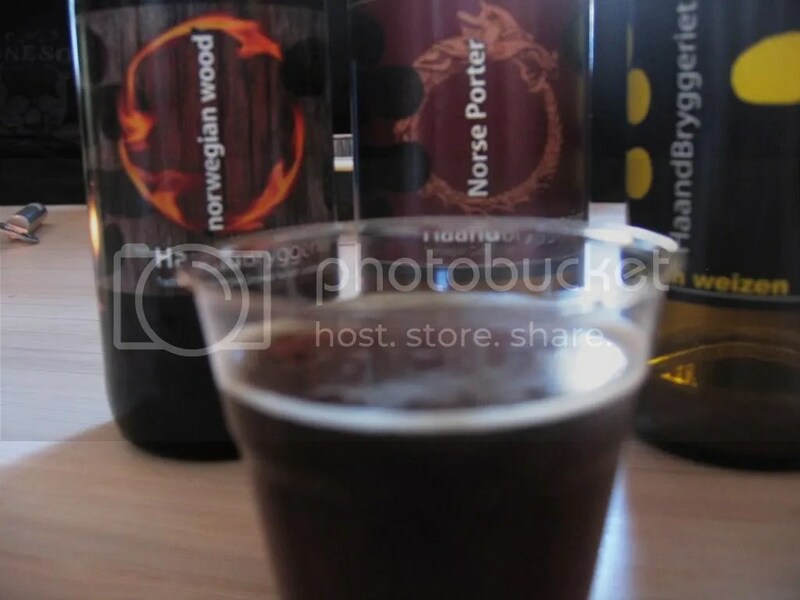 I am primarily talking about Nøgne ø, Haandbryggeriet and Små Vesen. Their beers are now available at a number of hand picked bars around Oslo. Nøgne ø and Små Vesen are even installing beer engines in some places, and Haandbryggeriets wheat beer is available on cask. Having craft beer on tap is probably not a brilliant business plan in itself at the moment, particularly not for the breweries, who will have to do things by hand. But it is a great way to profile your brewery and your beers, so I hope it will give dividends in the long run. As for us beer drinkers, we now see the outlines of the promised land. Come January, I think I’ll organize a pub crawl in Central Oslo, focusing on craft beer. Three bars are on my list so far: Bar & Cigar, Parkteatret and Olympen. Bar & Cigar are having beer events and offer both Nøgne ø and Haandbryggeriet beers on tap. Their fridge has a nice range of domestic and import beers. 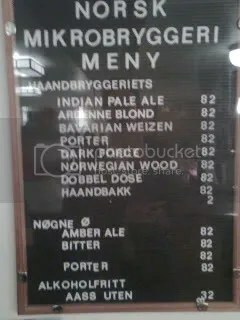 Parkteatret has a craft beer list prominently displayed, and the prices are very fair compared to the state monopoly stores. 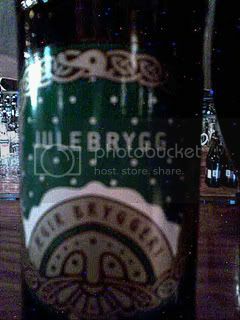 Olympen had the lovely Ægir Christmas brew yesterday, and I was happy to see people drinking craft beers during my brief stay. They have decent prices, too. U.S. border police pulled over a van decked out as a beer delivery truck close to the Arizona-Mexico border and discovered it was packed with illegal immigrants, authorities said on Tuesday. 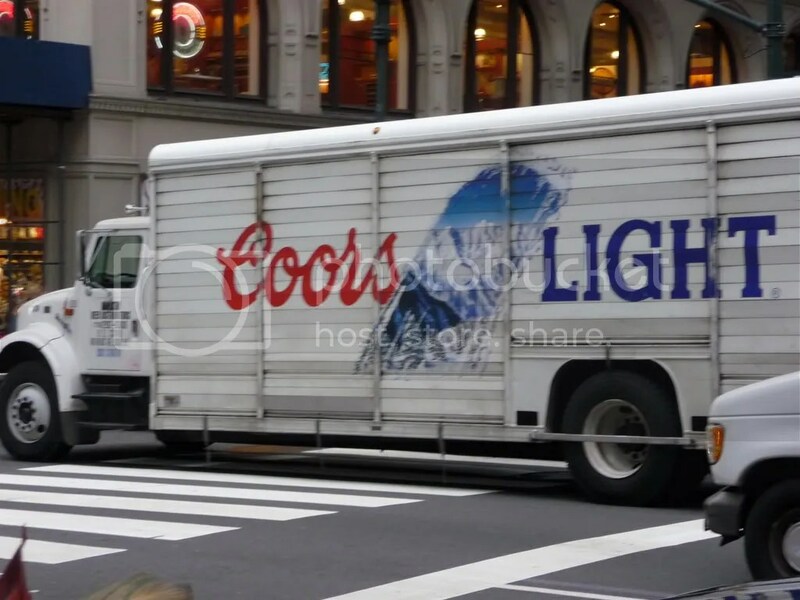 The white van painted with fake Budweiser beer logos was pulled over north from Sasabe, a small town on the Mexico border southwest of Tucson, early on Monday, said Tucson sector Border Patrol agent Mike Scioli. Well. As long as they don’t use logos from decent breweries, it’s all right with me. But it gives a new meaning to the term beer travel, doesn’t it? In this developing country when it comes to craft beer, it is often quite a threshold to try new beers. Some have not tried anything more daring than Corona and Guinness, others have been exposed to a Trappist or two when abroad. And how do you approach drinkers who think even trying a dark beer is daring? I think many bars would find it useful to have proper tasting notes. The two national micros of note here in Norway should supply the bars with basic information about the beers. They could be put inside the drink list, displayed at the bar or, at the least, handed out when a curious customer asks what the beers with the funny names are all about. The cannot all rely on beer evangelists on both sides of the counter, especially as it seems to me that the staff are usually quite ignorant. And it would be better if someone entering the wonderful beer universe is given a proper bock or a smooth saison instead of going straight for the tannins and sourness. There are some wonderful beers being brewed now, and some are filling up the fridges of pubs and bars around Oslo. But some of them should have a word of advice on how to drink them. When I started blogging, I wrote much more about individual beers. Tasting notes, anecdotes about the brewery, that type of thing. I rarely do that any longer. Why? Probably because others do this much better. But I try to cover newcomers on the Norwegian scene, at least when they have prime quality beers. But occationally I drink exceptionally good beers. This often happens at festivals or when we have tastings here in Oslo, when there is little time for taking proper notes. But this one, luckily, I opened at home on a Friday evening. This is one of the beers I brought home from New York. The Bittersweet Lenny’s R.I.P.A. comes from He’Brew, or, rather from the Smaltz brewery. 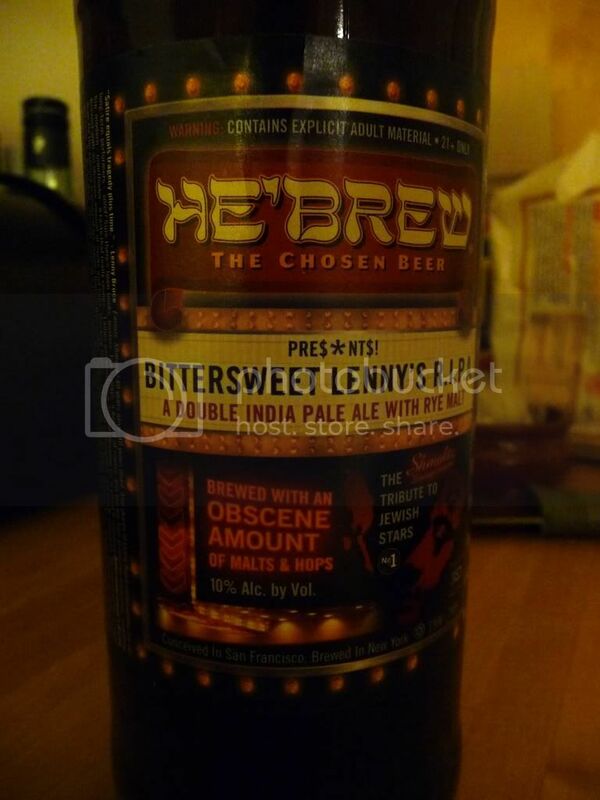 Their concept is making puns of everything Jewish, while at the same time making certified kosher beers. And I am not talking blond Maccabee lagers here, but extreme beers packed with flavour. The beer in question is dedicated to the artist Lenny Bruce, the reasons for this are a bit unclear to me. I had high expectations, particularly after making a renewed acquaintance with their pomegranate beer in New York recently. And I was not disappointed. This is a ruby read beer with little or no head. The aroma has raisins and sweet malt. The first sip reveals a complex beer. Grain, sweet fruit and flowers, dusty and dry hops. A alcohol warming in the background, and a little rye breadiness thrown in for good measure. Now, the kosher-abiding community in Norway is miniscule, so this beer will probably not be imported. But I have a pledge: I will not leave my home on the Sabbath – I will not even venture from my armchair – if I am given an ample supply of these. I have no particular feelings for Lenny Bruce, but I suppose I could work on that.